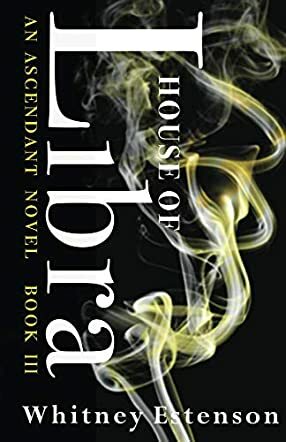 House of Libra by Whitney Estenson is the third book in The Ascendant series. Kyndal and Roman are official members of the Guard, which means they now must hide their relationship to avoid dangerous repercussions. She must play by the rules to have any chance to stop Set, which means getting along with the other two Guards, who have tried to kill her. As she goes through a series of tests and struggles to understand her visions, the Guard is sent to get help from a Nomarch whose methods are violent and unpredictable. To find an ancient and powerful scepter before Set does, she and Roman must turn to surprising allies and even enemies. Whitney Estenson plays with the idea of forbidden love, using it to add tension for Roman and Kyndal but never letting it pull them down or tear them apart. It's refreshing to see them not falter, even when it's tense between them. They realistically handle various problematic situations that occur. The way they handle problems in their relationship allows for their intense bond to get stronger. They respect and trust each other, and though they have things to work through, they do have a relationship that works. The story is complex and has many complications for Kyndal, both in her romantic relationship and in her role as a Guard. House of Libra provides plenty of adventure which takes them back to the place where the story began, along with a couple of other exciting locations. Everywhere they go, action-packed fights find them and get more intense as the story unfolds. The history and mythology of the society is further explored, supplying new danger and setting up new twists leading to a shocking ending. One of the biggest obstacles Kyndal faces, other than her relationship being secret, is having to work with people who have betrayed them so it's a constant need to stay a step ahead of everyone else. House of Libra is another action-packed journey which finds Kyndal faced with new surprises and uncovering secrets with adventure and romance.